Among the miscellaneous treasures of the famous Café Procope is this table which supposedly belonged to Voltaire. 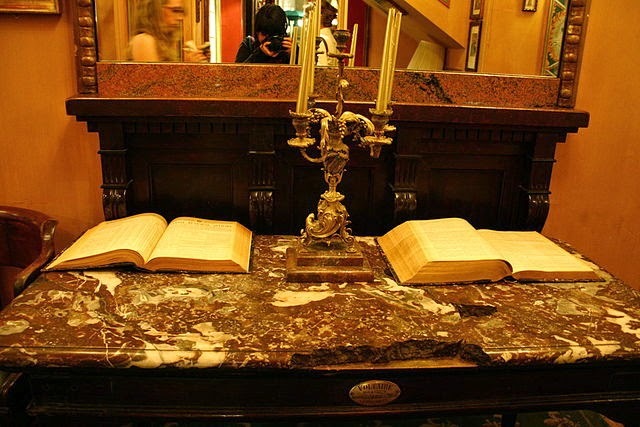 Whilst it is not actually stated, the implication is that this was Voltaire's personal table at the Café. The label on the front - old but not necessarily 18th century - says that the table was a gift to the philosopher from Frederick the Great of Prussia. 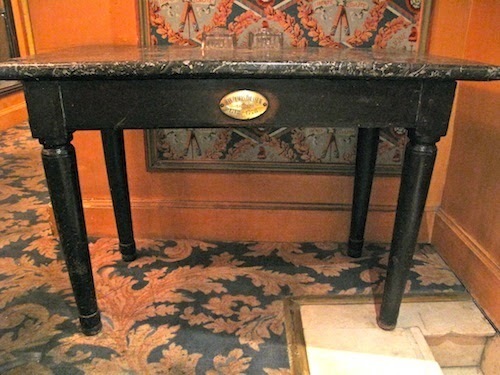 It is not a handsome piece of furniture, with its chipped marble top; Jacques Hébert apparently did the damage by standing on it to address the crowd outside the Café door The one further piece of information volunteered on various websites, is that during the Revolution, the ashes of Voltaire, and subsequently those of Marat and Le Peletier de Saint-Fargeau, rested here during their funeral processions. 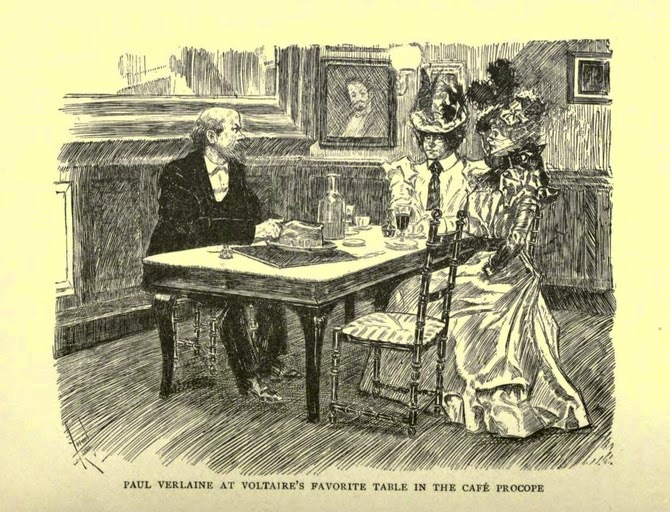 "Voltaire, in his eighty-second year, whilst attending the rehearsals of his play Irène, descended from his chaise-à-porteur at the door of the Café Procope, and drank the coffee which the café had made fashionable. It was here also that he became reconciled to Piron, after an estrangement of more than twenty years." (Morrow,p.219). This episode is temptingly plausible, but I haven't found any verification whatever; Voltaire's old enemy Alexis Piron died in 1773, whilst Voltaire was still far-away in Ferney. Voltaire is often cited as an early coffee-holic, preferring coffee mixed with chocolate. 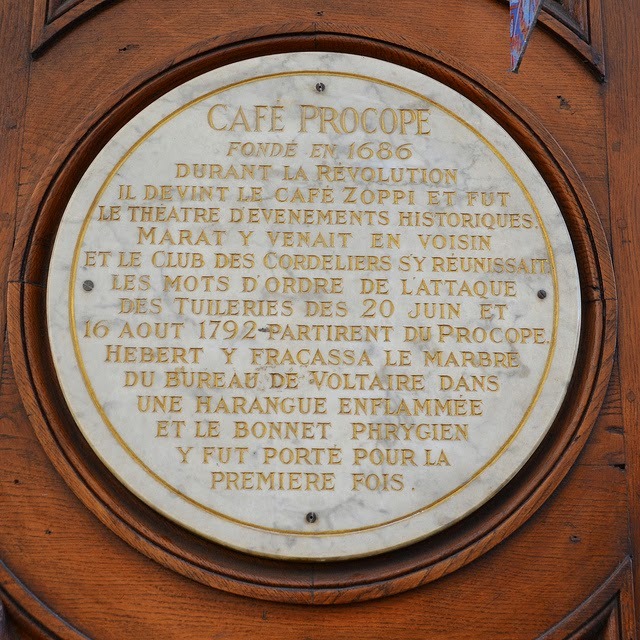 However, the statement that he drank forty or fifty cups a day - sometimes at the Café Procope itself - is clearly fantasy; even Balzac didn't manage that much! Did Frederick the Great give Voltaire the table? That's what the label says, but I am confused. Isn't this supposed to be the table that Voltaire used in the 18th-century café? In any case why on earth would Frederick want to give such an uninspiring piece of furniture to Voltaire? Are we supposed to infer he sent it from Potsdam or that he had it made in Paris? Or perhaps he somehow sponsored a reserved table at the Procope? Maybe the table is simply spurious and came from elsewhere, complete with its label? It is to this era that the upstairs salon dedicated to Voltaire belongs. Contemporary engravings show Paul Verlaine in his favourite place, seated at the great man's table. "M. Théo" was a history enthusiast and a collector; "He has worked out the history of the café, and has at the ends of his fingers the life-stories of its famous patrons” (Morrow, p.217). One wonders just how much creative licence he allowed himself? 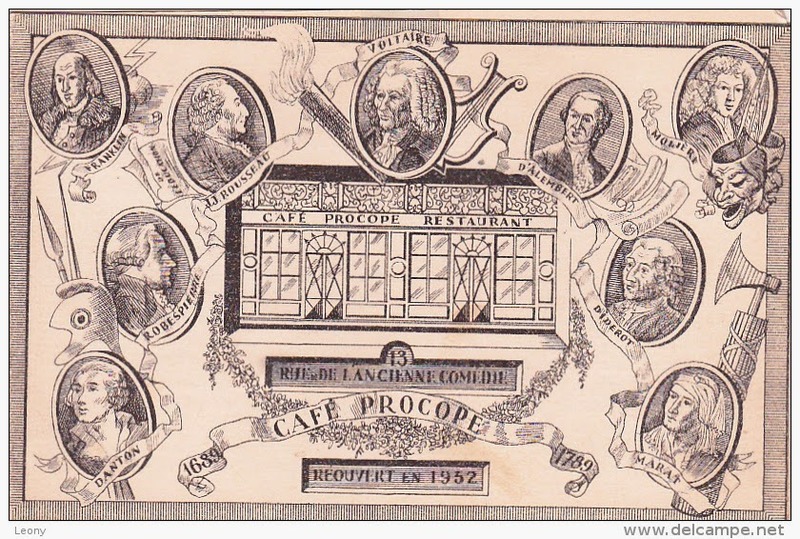 In the early 20th century the Procope went downhill, becoming a modest restaurant frequented by the students and white-collar workers of the quarter, and in the 1920s once more a café. It was known for a time by the name Au Grand Soleil. The present restaurant was completely renovated and re-opened in 1952. It was once more refurbished in 1989. This is worth emphasising - the plush 18th-century interior has been recreated from scratch; very little survives from the 1890s, let alone the time of Voltaire. W. C. Morrow "The Café Procope" in Bohemian Paris of today (1900) p.207-220.